Need someone to take care of your wildlife problems? Click my nationwide trapper directory. 07.23.2005 - Oh no! I'm about to face the paralyzing strike of the deadly Black Mamba! I have only a few precious minutes of life left to make this web page about the bite and to change into some nice clothes for the morgue! Never mind updating my will, calling loved ones, and reflecting on life - I have a duty to provide my readers* with the above photograph and account of the incident. Hmm, I seem to still be alive... I suppose that perhaps this wasn't a Black Mamba after all, but a harmless Black Racer. Yes, now that I look at the picture carefully, I see that this is the case. Oh, and I also just remembered that Black Mambas are actually gray (with black mouths). Whew! I guess I'm going to live after all. I suppose that this means I should take off this dusty tuxedo and put my wildlife removal uniform back on. Okay, what we see above is a photo of a snake strike in action. I don't recommend messing around with snakes, in particular if you cannot identify the snake with 100% accuracy, or if you're drunk. Most cases of snakebite occur when people attempt to catch, kill, or taunt snakes. 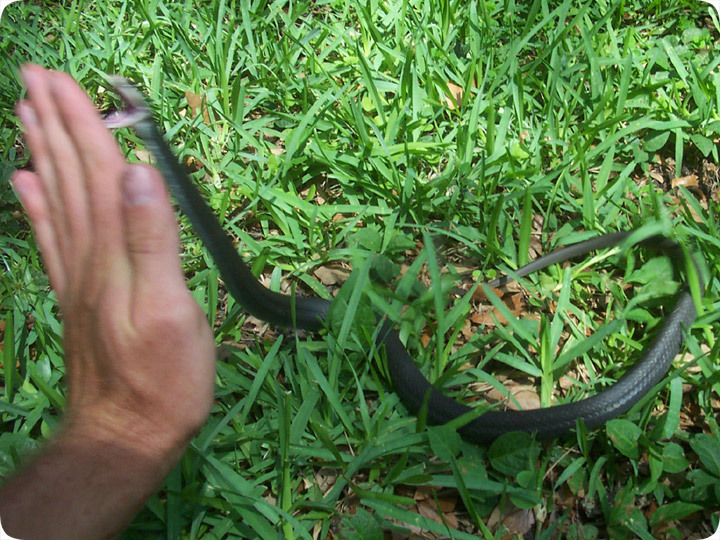 In the case of the Black Racer, I don't care if it bites, because it has only teensy tiny teeth, and no fangs. And with no fangs, it can't really bite a flat surface, so that's why my hand is spread flat. It merely bumps into my soft palm of fingers, and no one is hurt. How do you get a snake to strike? Corner it and taunt it. How do you prevent a strike? Leave it alone. it's that simple. Remember, you shouldn't play with snakes, because they can, in general, strike extremely quickly. *Joe and Steve, all two of them. Do it yourself: Visit my How To Get Rid of Snakes page for tips and advice. Get professional help: Visit my Nationwide Pro Directory of snake removal experts. For more wildlife stories, click my Wildlife Blog, or more specifically, my Snake Removal Blog or click my below banner to hire a local trapper.